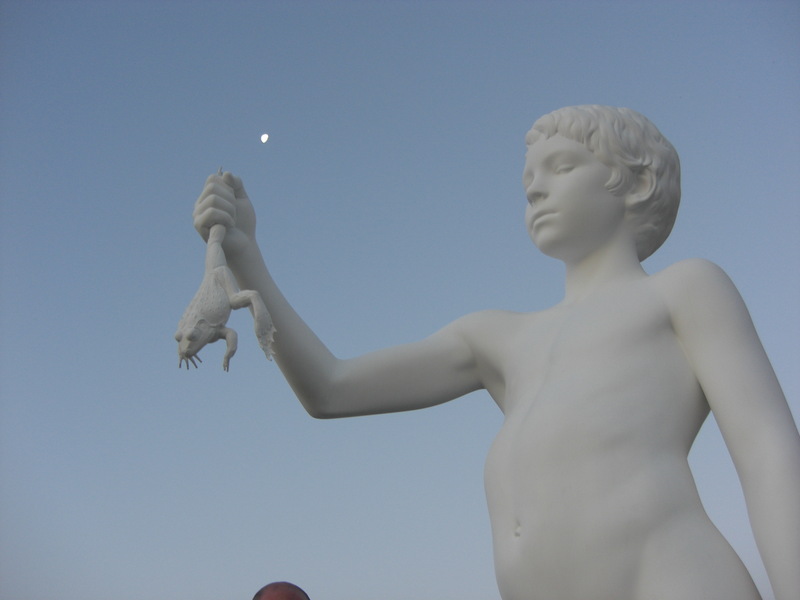 I was lucky enough to work for the British Council and Arts Council of Northern Ireland at the 2009 Venice Biennale. My time in Venice was professionally priceless; it gave me the opportunity to engage with art and artists from around the world. I came away from Venice feeling inspired and challenged in equal portions. The Venice Biennale presented the perfect opportunity to experiment, network and produce events and exhibitions. Myself and a group of staff from other galleries decided to put our heads together and start a collective through which we could curate and show work during out time in Venice. Over a few bottles of Prosecco we decided on ‘Parallax’ as the name of our collective. Within the space of a few days we planned our first event a ‘see + talk’ session which we held in the court yard of the Northern Ireland pavilion (and the former home to Vivaldi! )This event was attended by over 30 people from more than 10 different countries, it took the form of a Pecha Kucha style event, with each artist discussing and answering questions about their work. Over the following weeks we curated performance art ‘crawls’, these consisted of site specific performances that engaged with the architecture of venice, we held exhibitions in apartments and palaces, we held making sessions from origami to drawing nights. Parallax challenged the idea that the Venice Biennale is a place for established artists, it threw the floor open to a new generation or artists, curators and arts managers. Parallax provided us with the opportunity to examine our own practice, to grow professionally and to work in a peer supported environment. Parallax was unique in that it was not a funded project instead it was a collective of like minded people who pooled resources and expertise from printers to projectors, from web design to graphic design from courtyards to bedroom walls. Quite simply we had an idea, and we put it into practice. Since the last Biennale Parallax has remained an active group of like minded individuals. 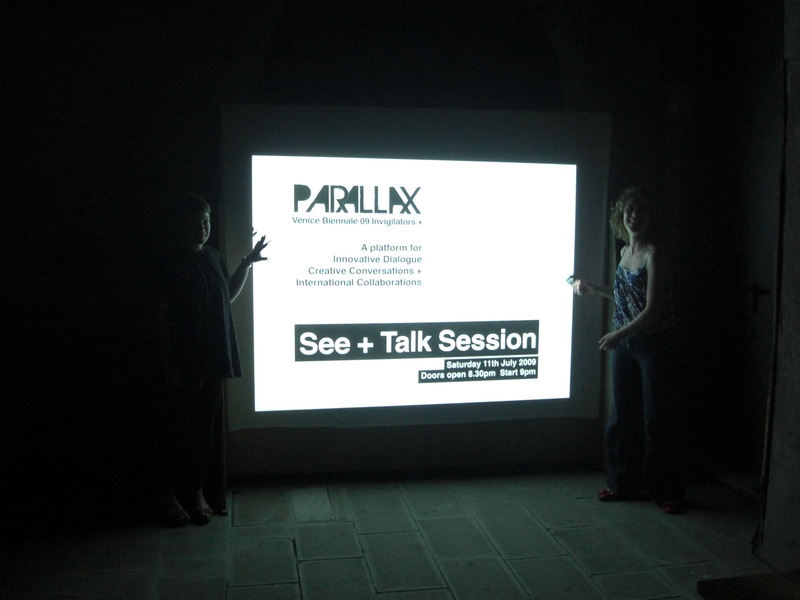 Earlier this year we were contacted by galleries asking about how they could become involved in Parallax at the 2011 Venice Biennale. It’s exciting to know that a small idea dreamed up over a bottle of Prosecco has made such an impact. 2 years after it was first conceived it has become a source of inspiration and mentoring for those working at this year’s Venice Biennale. Due to funding problems Northern Ireland won’t be at Venice this year, however Parallax will. The Fruit Market gallery are keen to breathe life into Parallax and I can’t wait to see how their invigilators creatively respond to living and working in Venice. My advice to anyone working at this year’s Venice Biennale? Bring Berocca- you won’t get a lot of sleep!